On Friday, October 19, 2018 at approximately 5:25am, the Santa Ana Police Department (SAPD) received a call of a pedestrian lying in the roadway in the middle lane of Bristol Street south of Central Street. As the reporting party was speaking to SAPD Dispatch, the pedestrian was struck by a vehicle. The vehicle, described as gray or tan in color, was last seen headed north on Bristol. SAPD Officers arrived at the scene to find the pedestrian, who was wearing dark clothing, non-responsive in the #1 northbound lane of Bristol. Orange County Fire Authority personnel arrived and pronounced the pedestrian deceased at the scene. At approximately 6:47am, SAPD Dispatch received a call from a female stating she knew who was involved in the collision that had occurred on Bristol approximately 45 minutes earlier. The female further provided the name of a male, the vehicle description and its license plate and an address where they could be located. Investigators from the SAPD Collision Investigations Unit (CIU) responded to both the collision scene and other location to handle the investigation. The preliminary investigation has revealed the pedestrian was lying in the #1 northbound lane of Bristol Street when he was struck by the vehicle which was headed north. Following the collision, the vehicle briefly stopped before continuing north on Bristol. The driver, Juan Carlos Alcantara, and the involved vehicle were located at the Santa Ana residence. The driver provided a voluntary blood sample and is believed to not be under the influence of alcohol or drugs at the time of the collision. The pedestrian’s sobriety will be determined through a forensic toxicology analysis completed by the Orange County Coroner’s Office as part of the autopsy. 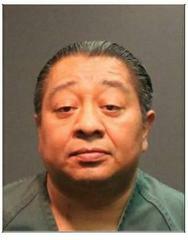 Driver Juan Carlos Alcantara was placed under arrest and booked into the Santa Ana City Jail for 20001(A) CVC, Hit & Run – Felony, and 12500(a) CVC, Unlicensed Driver. Anyone possibly having information about this collision are asked to contact the Santa Ana Police Department’s Traffic Division at (714) 245-8200.